This 4th of July, pay tribute to the President who “made America Great the first time”: George Washington. With the latest season of “Saturday Night Live” behind us, Alec Baldwin dusted off his Donald Tump impression (and his powdered wig) to dress up as the original POTUS — George Washington — and promote his new special, “One Night Only: Alec Baldwin,” airing on Spike. There are just a few things President Alec Washington would like you to know: He won all 13 colonies in a total landslide even no one thought he could do that; the British are losers; even Kerry Washington is named after him; the French had nothing to do with meddling in the American Revolution; and most of all, he cannot tell a lie. “First, you’re welcome. You know, for your amazing freedoms,” Baldwin says. 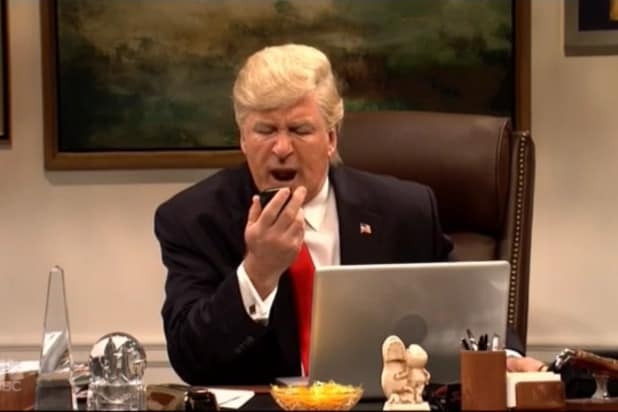 Baldwin said he will return to “SNL” as Trump next season. Baldwin’s recurring appearances were a major factor in the show’s dramatic ratings surge during its 42nd season. The season premiere back in October was the show’s highest rated premiere since 2008, with ratings up 17 percent year-over-year. “One Night Only: Alec Baldwin” premieres Sunday July 9 at 9 p.m./ 8 p.m. Central on Spike. Watch the video of Baldwin as President Washington-Trump above.